I have no knowledge of cryptography. But the author, Jim Sanborn, has just revealed a clue, and (who knows) maybe it’s not too hard now. The just-revealed piece of K4 is the word Berlin, which, when K4 is decoded, should appear in the positions 64-69. Second, there’s the linguistic (or the semantic?) side of things, that should help decide what this last piece is about. While I have made no progress on decoding whatsoever, I am pretty sure I know what the text, that is to be discovered in K4, will say. Let me share it. The Berlin Tunnel was a project code-named Operation Gold. The tunnel was build by the CIA together with the British Secret Intelligence Service, to tap conversations on the East side of Berlin. It was a large information gathering project. There was illusion on both sides. The Americans felt that the project was successful, while the Russians knew about it from day one from a British double agent (a mole) George Blake. 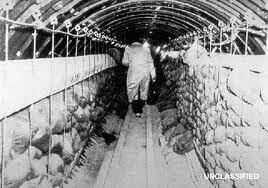 The fact of the spy’s actions became known about five years after the Tunnel was “discovered” by the Russians. The story is even more complicated, as the KGB, after learning about the tunnel from Mr. Blake, did not let the Soviet Army know, so it’s likely that conversations that were tapped were between people who had no idea about being heard. (It’s quite a story, I recommend reading about it!). I am wondering whether the sculpture itself is supposed to remind us of the iron curtain. Also, take a look at the article: BERLIN: Wonderful Tunnel (1956). It gives us a few more initial details on the Tunnel discovery, and its style seems more like “Jim’s style” in k1-k3 to me. 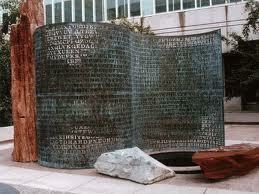 I remember this tunnel but never thought to put it in the context of Kryptos. Very nice. I will be interested to see what K4 says and see if it does apply to Cold War tensions. Could the Berlin tunnel be a clue to Enigma or SIGABA? DDR still used Enigma that time till 1955 and CIA used SIGABA. I am not sure. You see, you have to first “unmask the English” using a technique “unknown on the planet”. Only after you have done it, you can start looking for any language patterns. The encoded text has all of the letters of the alphabet, pretty evenly distributed; on top of that, it has some clever hints inserted into the code. How do you get there? This is the question number one.